If an illness is preventing you from attending an exam/class or completing an assignment, it is possible to seek a medical note by visiting the Health Services urgent care walk-in clinic, or an off-campus clinic. 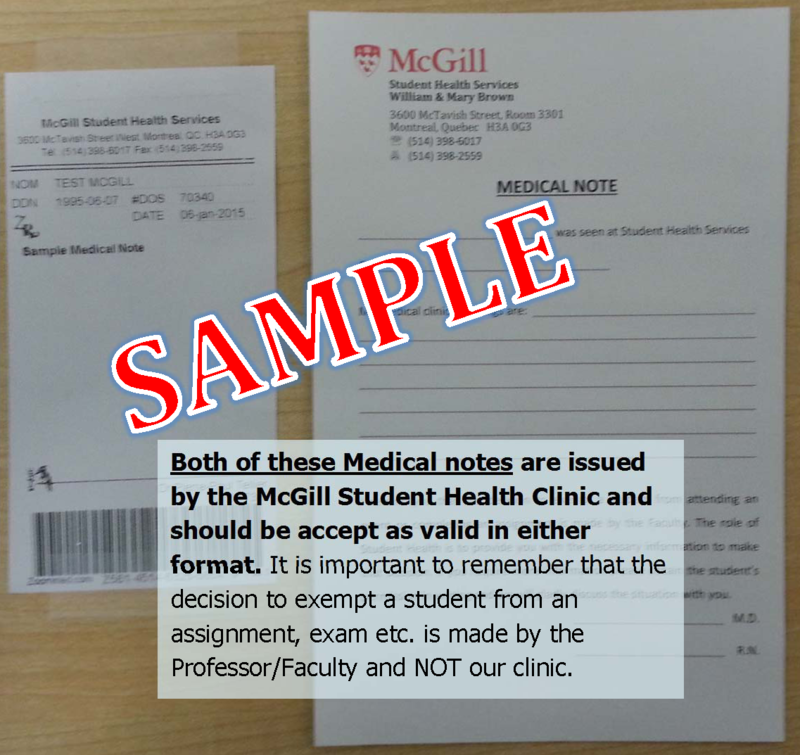 This being said, McGill has strict guidelines concerning medical notes, and it is important to inform yourself of them before proceeding. Medical notes will ONLY be issued on the day of the missed exam, assignment, project, class or conference. Absolutely NO medical notes will be written for past illness (ie: on a weekend, the day before, etc.). Medical notes are given at the discretion of the doctor or nurse. They will write notes based on their medical findings and professional assessments. The nurses and physicians at McGill Student Health Services DO NOT have the authority to exempt students from exams, etc. The final decision will be taken by the Professor, Faculty and/or Dept. Medical notes can be issued by medical personnel at private clinics, CLSCs, emergency rooms, etc., but please note a charge may be incurred for this service. If you were treated outside Student Health you must get a note from the institution of record as Student Health will not issue a note for an outside clinic's treatment. No medical notes or confirmations that you presented yourself at the clinic will be issued once the clinic has reached capacity for the day. Due to the high volume of drop in patients we encourage you to arrive as early as possible to ensure you will be seen on the day of your exam, class etc. in question. Once the clinic has reached capacity, students in need of medical notes must visit an Off-campus clinic. Please see an example of our 2 types of Medical notes. All students requesting copies of documentation from their file must complete a Release of Information and submit it by fax, standard mail, or in person at the clinic. Please note that test results can never be released over the phone nor by email. If your file has been archived it may take us longer than normal to provide you this information. Please also note that your file is destroyed 8 years after your last visit, and we will no longer be able to release your information after such time. Most requests are completed within 5-7 business days. The time to process requests will be longer if you are requesting recent test results. In such instances, we must wait for the test results to be returned to the clinic and reviewed by a doctor before we can start to process your request.